After all harsh events that Mostar has survived, only one place seems to be a symbol and to preserve the atmosphere of the old Bosnian city, old city of friendship where all nations used to live in peace – the old Mostar. Mostar, a city lying on the banks of river Neretva, in the heart of Herzegovina, in Bosnia and Herzegovina, leaves no space for indifferences. The impressive nature of the river Neretva, in whose turquoise colour is the charming Stari Most (Old Bridge) portrayed leaves every passer-by breathless. On the other side, the numerous ruins of the last war witness the severity of the events played in its not so far history. Since then, the city has been divided between the Bosniaks and the Croats. A very small number of Serbians live there as well. The West side of the city belongs to the Croats, while the Eastern one to the Bosniaks. None of the community would dare to cross those borders. The division is harsh and shows in all parts of the city functions as well as in the educational system. However, there is only one place in the heart of the city where all tensions seem to disappear. That place is a school, composed of a local public high school and an international one, the United World College in Mostar (UWCM). These particular school has eradicated and broken down all the barriers, and promotes friendships without prejudices and judgements. The school building is located in the heart of the city. Painted in bright orange, the building cries out among the scars of wars and ruins all around. The high school Mostar (Gimnazija Mostar) and UWCM share this building. Nonetheless, the impact of the division on the schooling system can still be seen in this high school where the Bosniaks are located on the first floor while the Croats stay on the second floor. They learn as well two separate national curriculae. UWCM however, is on the third one and gives the possibility for everyone to be together in one place. It was created in 2006 and opened officially by Queen Noor of Jordan. The original goal was to contribute in reconstruction in post-war countries. It was founded jointly by UWC and the International Baccalaureate Organization aiming to support the process of peace. It is home to numerous students of various nationalities all over the world, the United States, Germany, Austria, the Netherlands, Rwanda, Norway, Turkey, Czech Republic and many, many others. Successfully indeed, it stands firmly in giving the opportunity for real friendships and truly, all the tensions among divisions seem to disappear. As the one sets their foot on its premises for the very first time, many smiled and happy faces warmly welcome no matter of what the nationality is. One of its ex-students, Melina Stevanović, from Bosnia and Herzegovina, who studies now in the United States, says: “UWCM was one of the most beautiful memories and experiences. I will always remember it for its beautiful and healthy friendships with people of different religions and nationalities, quality education which opens the door of the colleges and universities all over the world. What I do appreciate the most is that I grew up, far from my family, learned what it means to be alone, having to take all the responsibilities at the age of 16, surrounded by the people you do not know yet, but also in the city unknown and foreign, it was not that easy. It was a challenge which enabled me to go alone even to another part of the world, and that is where I am now. The friendships made in Mostar will surely stay as the prerogative of the greatest memories I have brought.” She adds that the city as itself which may not seem that divine and entrancing, hides the cultural heritage and the spirit of the past, which were one of the greatest benefits that she could experience and feel. The clash between two nationalities remains even today. However, it seems that friendships created at UWCM prove to be much stronger than these barriers and are able to cross the limits. Théâtre d’affrontements fratricides entre Croates de Bosnie et Musulmans pendant la guerre en 1992, Mostar est aujourd’hui coupée entre les deux belligérants d’hier, et en porte encore les séquelles, sur les murs et dans les mémoires. Selon le recensement de 1991, Mostar était la ville la plus multi-ethnique de Bosnie. Dynamique grâce à sa production d’aluminium, elle jouissait aussi d’une forte fréquentation touristique, attirée par la beauté de la vieille ville ottomane. Le jeu des nationalismes précipite le pays dans la guerre. L’armée yougoslave et les paramilitaires serbes attaquent la ville dès 1992, relayés par les Croates qui détruisent le pont en 1993. Ils sont mis en échec par une résistance bosniaque bégayante mais déterminée, craignant un accord secret entre la Serbie et la Croatie visant à diviser la Bosnie au détriment des musulmans. 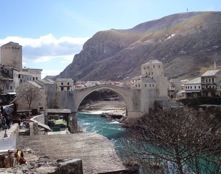 En 2004, le pont de Mostar est reconstruit. C’est un symbole, même s’il ne joint pas exactement les deux parties de la ville. Mais la guerre est encore là, à fleur de peau. Aujourd’hui, 43,8% de Croates, 43,2% de Bosniaques et 14% de Serbes, regroupés dans les parties de la ville où ils sont majoritaires, peuplent Mostar, désormais située en Fédération croato-musulmane. Construit sur la ligne de démarcation, le United World College in Mostar, improbable bâtiment orange, semble être la seule tentative visible de réconciliation où Croates et Musulmans étudient ensemble. Par les fenêtres, deux bâtiments détruits. La guerre n’est jamais loin. Certains habitants ne se rendent jamais dans l’autre partie de la ville, donnant à Mostar des allures de Bosnie miniature. Il n’est pas rare qu’une jeune fille voilée se fasse jeter des pierres par des enfants, et à la compétition de saut annuelle du pont, très peu de Croates participent. A Mostar, la guerre, c’était hier. Et nul ne sait combien de générations devront défiler avant que les mentalités évoluent.